This module shows how to handle routine errors in user defined functions (UDFs) and other procedures. The simple example used is a function to return the reciprocal of a number, with the error raised when divide by zero occurs. Three variations of the function are developed in Code panes 1, 2, and 3. Without any specific error handling, all three return a #VALUE! error when used as worksheet functions. The analyst wants to replace the #VALUE! error with a #DIV/0! error. In Code 1, the divide by zero condition is tested by the If statement in line 4 . If Number = 0 is TRUE, then the CVErr(xlErrDiv0) value is assigned to the function name xlfReciprocal_1 in line 5. Execution then skips to line 8. The #DIV/0! error is code value 2007 (see the Cell Error Values table below) with an enumeration of xlErrDiv0. This value is converted to an error with the VBA CVErr function. CVErr returns a Variant with subtype Error, thus the function name is set to type Variant to allow this return type. The xlfReciprocal_3 function contains no error handling statements. In the case of a an error, it returns a #VALUE! error from the worksheet, and raises a Debug Error message when called from a VBA procedure - see code 4 for statement details. The Debug Error is in figure 1 - top panel. It is called a Debug Error because the default button is Debug. 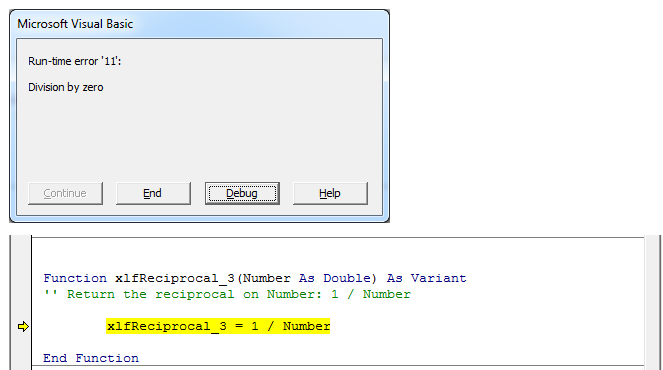 If the Analyst clicks the Debug button, the code window displays the Yellow step line at the place where the error was raised (figure 1 - lower panel).